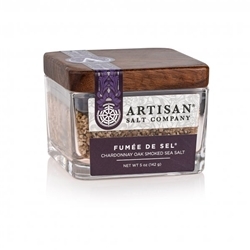 5 oz Fumee de Sel is premium Fleur de Sel Crystals that are cold smoked over oak wine barrels that have been used for years to age fine Chardonnay wine. This salt is one of a kind. Use as a finishing salt on salads, veggies, meat...almost any dish.